It has not been a quiet week in Jenkintown. Last Wednesday, like it or not, Peggy and Dave Downs had yet another day in court fighting a citation for running a business that does not exist. Never has. The Borough’s original citation claimed that the Downses were operating an unspecified “commercial business” in violation of zoning which allows only a “zero impact business,” i.e. one that does not make noise, generate odors, or generally disrupt the peace of the neighborhood. The Downses faced a $500 fine, but instead they took the Borough to court where last March 26, Judge Elizabeth McHugh dismissed it for omitting an important detail — the type of business. This took twenty minutes. The Borough wasted no time reissuing the citation. Hours later, they sent out a new version that cited them for operating a landscaping business. It arrived at the Downses two days later on March 28, and just in time to prevent Borough Council from discussing the matter at their meeting that very day. A code violation citation requires a site inspection, otherwise the complaint has as much validity as a Yelp review. Rather than paying the fine and admitting guilt, the Downses opted to appear before the Jenkintown Zoning Hearing Board, which required a $1,000 filing fee. That hearing took place last Wednesday, May 30. What should have been a one-to-two hour hearing with a basic rundown of well-documented facts, comment, discussion, and dismissal, became instead three-and-a-half hours of Franz Kafka’s Theater of the Absurd, that involved, among other things, a 40-minute discussion about leaf blowers and weed wackers. Our live stream of this hearing finally gave residents the opportunity to see first hand our Borough Manager’s low caliber and whether or not he justifies the six-figure salary our council awarded him. Mr. Locke by most accounts seems to be a truly nice guy who comports himself professionally. Many sing his praises, and I even had the good fortune of a pleasant conversation with him in the neighborhood, where I got to meet and pet his beautiful dog Maisy. I’ll bet the guy tells a great story. However under cross examination, his confidence in his own documentation withered under questioning. Mr. Locke didn’t seem to grasp the impact of his words, and his expansive interpretation of code left the gallery gasping with incredulity. In another illuminating moment later on, George Locke asserted that the Downses could simply settle this matter with a letter declaring their full compliance with the code. Moments later, Mr. Yanoff produced that letter which said exactly that. A code violation citation requires a site inspection, otherwise the complaint has as much validity as a Yelp review. On at least two occasions, the Downses invited Mr. Locke to inspect their premises. He never accepted the invitation, but instead said repeatedly that he conducted inspections from the “public right of way.” In other words, from his car. He claimed he didn’t accept the Downs’s invitation, because he didn’t think they’d be mowing grass in November. The Borough’s entire case rests primarily upon the word of Joe and Christine Glass and upon their photographs. While the Borough did not share these with the gallery, it did describe them in some detail. They showed Dave Downs pushing a lawnmower described by Mr. Locke as the type used by professional landscapers, a back-pack style leaf blower, the Downs’s pickup truck, and gas-powered grass trimmer. The borough provided no evidence that Mr. Downs used any of this equipment in a professional manner — i.e. that he received money for his services — just that he possessed these items. This presumption would implicate anyone with a Viking stove who bakes cupcakes for a bake sale, a paneled van volunteered to carry kids to camp, a floor-standing drill press used in the making of bird houses, or anyone in possession of a contractor-level power tool used on a neighbor’s property. Unlike citing a disturbance for making too much noise, as the Borough might have done, a commercial home-based business invites scrutiny from the IRS or the DOR, since “commerce” implies income. Otherwise, they and most people would consider it a hobby. If your hobby gets a little noisy, then usually a friendly call from the Borough or the police corrects the problem — at least in most communities run by people endowed with common sense. Frank Reiley (in green sweater) testifies at the Jenkintown ZHB hearing. Perhaps the most bizarre scene in this show came when the Borough called its first witness, the owner of 303 Runnymede, Francis (Frank) Reiley. The Board had already declared their intention to continue the hearing on June 7, but the Borough requested that Mr. Reiley should testify that night as he would be in Kabul, Afghanistan on that date. Mr. Reiley works for a government contractor, not the military which might justify deference. This begs the question, could anyone whose work took them out of the country during the next hearing ask permission to speak that night? Mr. Reiley’s testimony offered little insight into the matter. As an absentee landlord, he had little to no exposure to the day-to-day events on his property. Mr. Reiley claimed that Mr. Glass owed thousands in back rent, likely because of the conviction, so naturally Mr. Reiley had a vested interest in making this problem go away, even if it meant undermining the legitimacy of the Downses complaints under oath. In testimony that stretched for more than twenty minutes, Mr. Reiley failed to make his appearance at all relevant, but it did guarantee a second night of testimony and more billings for the attorneys. Below is the two-minute “public comment” that the ZHB allowed Mr. Reiley to make a week early. 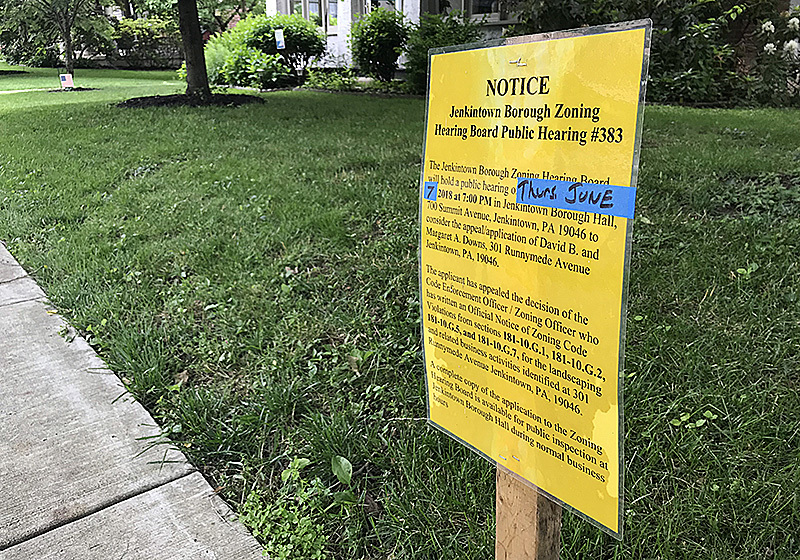 As a matter of course, the Borough sends out a notice about these hearings to all residents within a 300-foot radius of the property and posts signs on the front lawn. The Downses also notified everyone they knew in town to attend in support. As a result, Borough Hall had another packed house, but because the hearing stretched into the 10 o’clock hour, a period of cross-examination by the board, by neighbors with standing, and public comment would have to wait. According to heavily redacted documentation supplied by the Borough as part of a Right-to-Know request, Sean Kilkenny’s office has received nearly $6,000 in fees as of February of this year. We have filed another RTK for fees and expenses paid to Kilkenny’s office and others from that point until the present. We do not expect the information before the next hearing, but we conservatively estimate that Jenkintown will transfer another $2,000 to $5,000 to Sean Kilkenny’s firm. The Downses have spent to date over $8,000. Mr. Hitchens’s tour-de-force turd-polishing wasted a considerable amount of time and resources, not just for the Downses, but also for the Borough, the ZHB, and all those in attendance who endured the discomfort of metal folding chairs or standing for three-plus hours. The room clearly recognized the Borough’s false accusations and ham-fisted actions that could crush some households in this town. To most in the room, Peggy and Dave Downs stood up for the preservation of our community and common sense. Council members who attended included Deborra Sines-Pancoe, Ann MacHaffie, Kieran Ferrell, Michael Golden, and David Ballard. If they did not come away from that hearing with a diminished sense of confidence in their borough manager, one could reasonably wonder what standard they applied in his hiring. The best thing the Borough could do at this point is to shut this kangaroo court down immediately and apologize to the residents and especially to the Downses for putting this town through this wringer. Adding a few high-level resignations would serve as a perfect a la mode to some humble pie. We plan to live stream the hearing on the June 7th, at 7:00 P.M. on our Walkable Jenkintown Facebook page and will then post the video to YouTube.